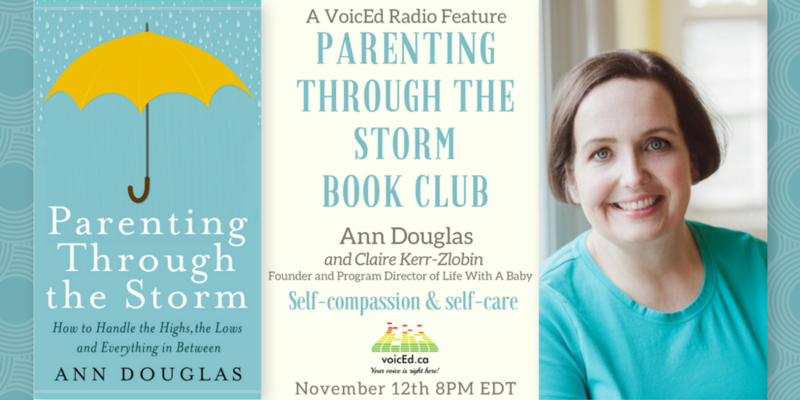 Ann Douglas is joining forces with VoicED Radio to host a four-week online book club focusing on her latest book, Parenting Through the Storm (a guide to parenting a child who is struggling with a mental health, neurodevelopmental, or behavioural challenge). Each week, she'll be zeroing on one of the key themes discussed in the book and inviting a special guest to chat with her. In the first segment (airing at 8 pm on Sunday, November 12), you'll hear Ann chatting with Kim Peterson, co-creator of the Ontario Special Needs Roadmap, about learning how to be an effective advocate for your child. Mark your calendar so that you won't forget to listen in live via this link. In Week Three (airing at 8 pm on Sunday, November 26), you'll hear Ann chatting with child and youth mental health advocate Michelle Sparling about the importance of reaching out for support when you're the parent of a child who is struggling. Mark your calendar so that you won't forget to listen in live via this link. In Week Two (airing at 8 pm on Sunday, November 19), you'll hear Ann chatting with Kim Moran, CEO of Children's Mental Health Ontario, about parenting a child who is struggling. Mark your calendar so that you won't forget to listen in live via this link. In Week One (airing at 8 pm on Sunday, November 12), you'll hear Ann chatting with Claire Kerr-Zlobin, Founder and Program Director of Life With a Baby (a non-profit focused on parent support and mental health) about self-compassion and self-care. Mark your calendar so that you won't forget to listen in live via this link.